Amsterdam was made for bicycling. Technically it’s still winter, of course, but today the sun is shining and the deep freeze that had all the Netherlands in its grip for a week or so is only a memory. With that in mind, here we present one more video — this one in retro style — of the ice skating fun we Amsterdammers had last week. It’s been more than a decade since the winter weather in Amsterdam was cold enough — for long enough — to allow people to ice skate the city’s famous canals. But the winter of 2012 will long be remembered for its excellent ice skating weather. Watch this beautiful video. In Amsterdam bicycling is seen primarily as the best way to get from point A to point B in a 700+ years old city that was not designed for heavy traffic. But tourists also view cycling in Amsterdam as a tourist attraction — either as a fun activity or a spectator sport. Tourists who visit Amsterdam generally concentrate all their attention on the city’s historic center. But Amsterdam has so much more to offer — not just in its various districts but also in its wonderfully-diverse metropolitan area. If you want to escape the hustle and bustle of everyday Amsterdam, a popular option is to take to the water. Tour the canals of Amsterdam in your own boat, a rented sloop, or on board of a glass-topped canal excursion boat. We’ve been having some nice weather here in Amsterdam these past few days. Nice for the time of year, that is. 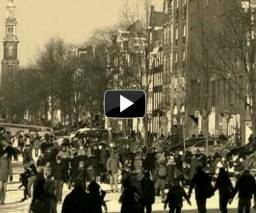 The video shows the type of ‘Sunny Day in Amsterdam’ we’re all longing for. Amsterdam provides the ideal business environment — a perfect balance of work and play, old world charm and highly advanced innovation. The city is host to many international conventions, trade fairs and business meetings.